Letters to a Young Librarian: Just For Fun: Mayonnaise! I'm going to go against the grain of typical blogs that share recipes. I'm going to give you my main recipe up front (based almost exactly on this one)! Put everything into a container with a mouth wide enough for an immersion blender, but not much wider. You MUST use an immersion blender for this recipe. After everything is in the container, put the blender in, and turn it on high - holding it still - for 30 seconds. You'll be tempted to move it, but don't. After that, move it around and blend the rest of the oil in, for another 30 seconds. Et voilà: mayonnaise! 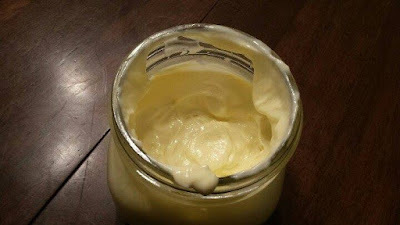 There are other methods that call for letting the egg warm up to room temperature or pouring the oil in very slowly, but if you are like me and have no patience but still want homemade mayo, this is the recipe for you. Now for the chatty bits! I told a couple of friends about making my own mayo now, and they demanded a taste test. With McDonald's french fries. Their idea, not mine, but it ended up working well. Anyway, I rose to the occasion and made four different versions (the one above and the others listed below), but there was no consensus on which was the best. I liked the spicy one the best, but both the original recipe (above) and the dill version got votes as well. We certainly had fun trying them, and I definitely had fun coming up with the different recipes. Spicy: instead of lemon juice, I put 2 tbsp of original Cholula. You need an acid of some sort in mayo, and hot sauce is made with vinegar. When I tasted the Cholula mayo, though, it didn't have any kind of kick, so I added a tbsp of Frank's RedHot. If I make this again, I'll just go with 2 tbsp of Frank's. Vinegary: instead of lemon juice, 2 tbsp of apple cider vinegar. This was also recommended by the person who wrote the recipe I cited above. It's not good for everyday applications, because the vinegar taste comes through super strong, but it's fantastic with potatoes. It'd probably be amazing for potato salad. Dill: instead of lemon juice, I put 2 tbsp of pickle juice, I also added a small amount of fresh dill - hard to explain how much, other than to tell you I pulled off a couple of inches from the top of the dill I bought. Didn't chop it up, either, since the stick blender did that for me. Yes, this does use fresh, raw eggs. That means it won't last as long as long as store-bought, but it will last a couple of weeks past the expiration date on the eggs you buy. But I gotta say - it never lasts more than a week for me. Good luck with this, and let me know how it goes!